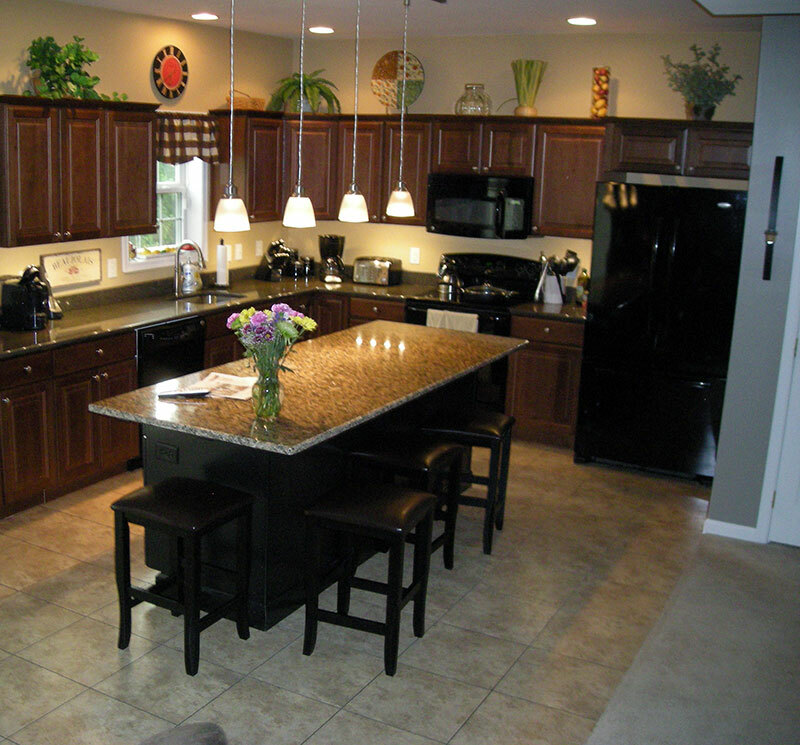 Countertop Island Supports are a great choice for supporting heavy countertops such as granite, quartz or butcher-block in an application where no knee wall exists and the countertop extends directly off the base cabinets. 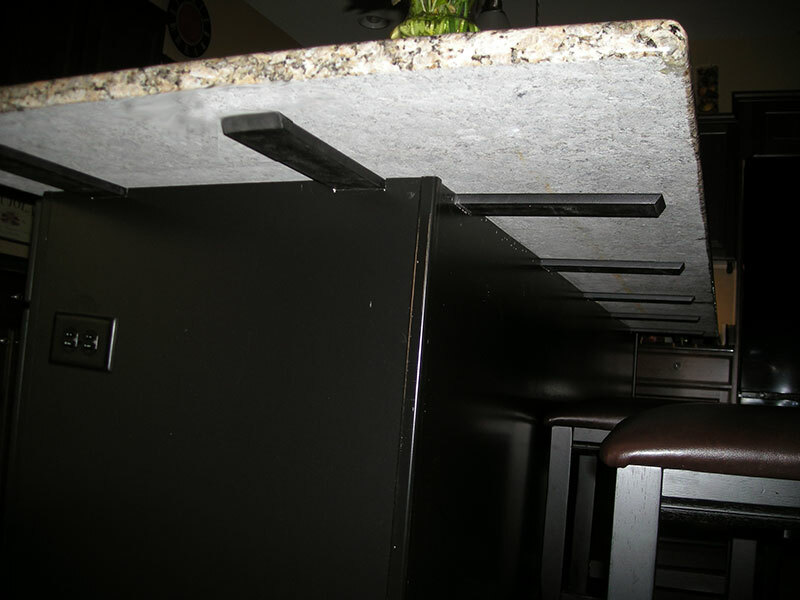 The Countertop Island Support is a solid ½ inch by 2 ½ inch steel bar that runs through the base cabinet (see the image above) and extends to the length of the overhang minus a couple of inches to keep the countertop support hidden from view. The countertop support has a ½ inch x 4 inch flange on the back that mounts via two screws (the screws are provided with the countertop support) to the inside of the cabinet face frame. The flange is short, hidden from view and does not interfere with the operation of the drawers. The countertop support then runs through the cabinet and rests in a ½ x 2 ½ inch notch in the back side of the cabinet. Before the countertop is mounted we suggest that the installer apply a bead of “Liquid Nail” on the top of the countertop support. Once mounted the countertop support creates a cantilever, leveraging the weight of the countertop as well as the ½ inch steel. It’s a great bracket and perfect for most Countertop Islands. 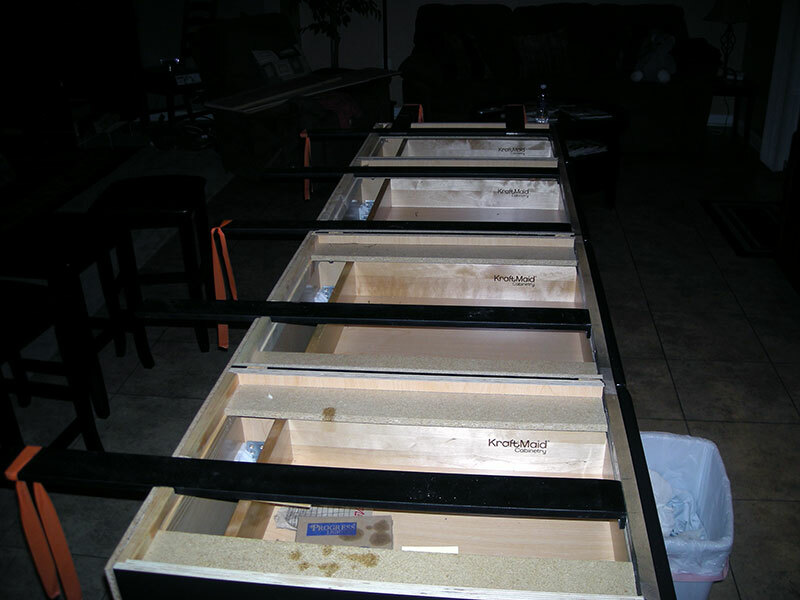 Below are several images one of our customers sent us showing the Island Brackets in place. Below we see the finished product with a 12 inch overhang on three sides. Typically you will see an overhang on one side only as is it difficult to support overhangs on multiple sides without giant corbels. Next we see the Island Brackets installed within the cabinets. The installation is a very simple process. A 2.5" x .5" slot is cut in the front of the cabinets for the brackets to rest in. The brackets are then attached to the cabinet by way of a small flange with two screws. The flange is short enough so that it doesn't interfere with the drawers or doors. To support the ends we use our patented Island Extension Brackets that are mechanically fastened to the adjacent Island Bracket allowing us to support overhangs on up to three sides of the Kitchen Island. The island support system can also be modified to support an overhang on all four sides of an island.